One of the best-known facts about Henry VIII is that he had a total of six wives. The Six Wives of Henry VIII has seen history turned into modern television drama, along with the whole history of the Tudors. None of his six marriages can be said to have had a happy ending, as two ended in divorce, two in executions, one in death and the final wife being lucky enough to outlive her husband. With so many marriages it can be difficult to remember in which order Henry’s queens came and went. When we put Henry VIII wives in order we start with the first wife, which was Catherine of Aragon. Catherine was married to the king for the longest of all of the six wives, and the one that he had the greatest difficulty in divorcing. 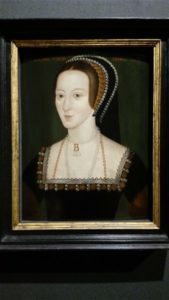 The second wife of Henry VIII was Anne Boleyn. She was already heavily pregnant when they were married. Anne was the first queen to be publicly executed after Henry had her charged with high treason. The third wife of Henry VIII was Jane Seymour. She is thought to have been his favorite out of all of the six wives. Jane is the wife that gave him the son that he most desperately wanted. Unfortunately, she died not long after the prince was born. Henry’s fourth wife was Anne of Cleves from Flanders. She was not his choice of wife, and if he had had his way there would have been no wedding at all. They were divorced within a year. The fifth wife of Henry VIII was Catherine Howard. She was much younger than the king and had no idea of how to behave in her new position as the wife of the king of England. Wife number five was another that was executed for treason. The sixth and last wife of Henry VIII was Catherine Parr, she was the only one to survive without harm or injury as she managed to outlive the king. Their names are not that difficult to remember, as three of them were called Catherine, two of them Anne and one of them Jane. Henry is believed to have loved all but one of his wives, that being Anne of Cleves. The marriage to Anne was one of political interest and not of love or infatuation as his others had been. A royal wedding is quite an expensive thing to produce, even in Tudor times, and having to go through that six times would probably have bankrupt the king. Rather than have a grand wedding followed by a coronation of his new queen, many of the marriages of Henry VIII were quiet, almost secret ceremonies. Not only did this keep the cost down, but he was also able to arrange the marriages when they suited him and not have to meet the needs and wants of the nation and his parliament.